Okay, you like what you see, but you want to know what your investment in your own personal “work of art” will look like. Keep reading and you’ll find all the information about our pricing. If you’re still not sure about something please drop us a note at info@daviscreativephoto.com . (You can scroll down to locate the links to our current price lists). Print or session payments are due before the prints are ordered from our professional printing lab. Unlike many other places we are not strict about our session times. Most sessions run between 60 and 90 minutes. At the moment all session are on location. A park, a farm, downtown, your home. If you don’t have a place in mind just ask us and we’ll find one. The session can be anywhere within 30 miles of Anderson, IN. If the session is over 30 miles from Anderson and still within Central Indiana an additional $30 travel cost will be added. Other destinations are possible simply contact us to work out the details. Below you will find some basic ‘A la Carte pricing along with links to pdf. documents with our latest package pricing (summer and fall 2014). 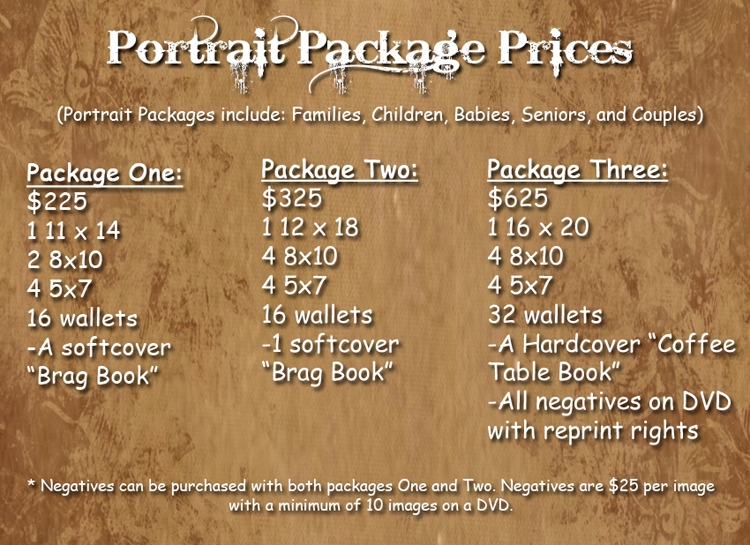 NOTE: For High School Senior packages add $35 and receive 48 more wallets with each package. To view our current prices simply click on one of the links below. You need acrobat reader to view the price lists. If you do not have acrobat reader you can download it here. To view our current wedding prices drop us an email at info@daviscreativephoto.com and we’ll send it to you.